If you’re looking to grow your company’s marketing department, you might be wondering what the most effective manner of talent acquisition is. Should you hire one or more in-house marketers? Or would working with a marketing agency service you better? Although it’s important to take note of the intricacies of your unique business case, working with a marketing agency often provides more benefits than a single in-house hire. The total annual cost of these nine specialists comes to $486,000, or $40,500 per month. And that’s just in salaries! This cost is not inclusive of overhead, insurance, training, bonuses, or other perks and necessities. Even if you’re looking for fewer specialists, many marketing agencies provide you with access to these same individuals for much less on a monthly basis. When you work with a marketing agency, you can expect your team’s resources to be able to hit the ground running from day 1. There’s no time needed to familiarize themselves with your sales and marketing platforms, no time needed to obtain certification in their specialty, and no time needed to understand how to work together with other sales and marketing departments. Once they get that initial onboarding meeting with your business, they set to work on supplemental research specific to your company and industry, and they’re ready to rock and roll. 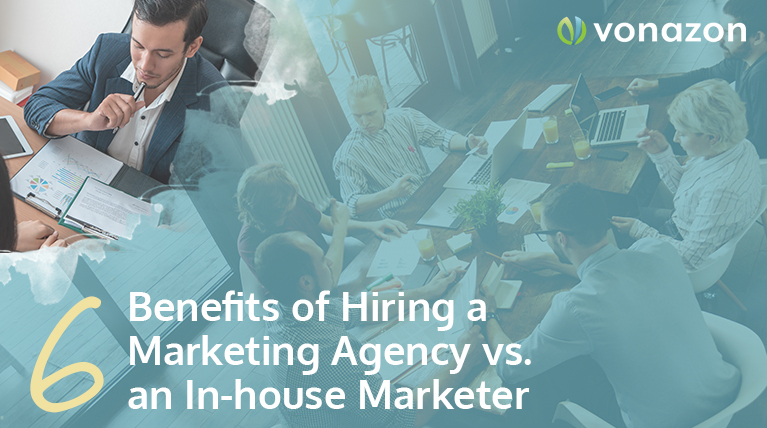 Whether you have a single marketer, a group of marketers, or even no marketers at all working in-house in conjunction with an agency, having an outsourced team allows your in-house staff to free up time. Instead of doing mundane or time-consuming tasks, they can focus on bigger-picture processes and help grow your business, and take on exciting new opportunities. When you hire one person, they can only do so much. No one person can know or be able to accomplish everything that your business needs to succeed in its marketing—which is why it pays to get as many people as possible working together on your objectives. 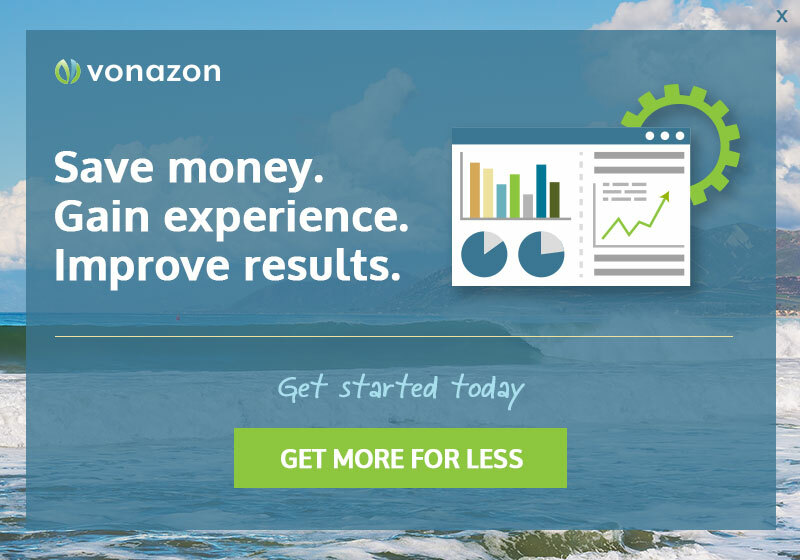 Vonazon offers 9 different marketing specialists for the same cost as hiring one in-house staff member; and with this large team, you have different background, perspective, skillsets, and expertise brought to the table. Your business can and will benefit from this! This topic goes hand in hand with the one previous; with a greater quantity of talent on your team, you have greater access to insight in different facets of digital marketing and the developments that happen from day to day. Marketing agencies are required to do the research necessary to deliver on your corporate goals and objectives, and with that time spent understanding how to most effectively target your leads, we can come up with innovative new ways to leverage technology, craft messaging and visuals, and break into new markets. Although it’s easy to dismiss “scalability” and “flexibility” as corporate jargon, they’re incredibly important goals to keep in mind. As your business grows through effective digital marketing, you need to be able to scale your marketing efforts and your team to keep up. Oftentimes, significant growth or an influx of new opportunities will also necessitate a shift in how your company handles internal processes, and the flexibility inherent to marketing agencies is an incredibly valuable perk that’s built into the basic business model! Although it would be easy to end the article here (there are so many benefits to working with a marketing agency! ), we do want to address the reasons that you should take into consideration when looking to hire a single in-house marketer. It’s important to have at least one person on your team who is committed—eight hours a day, five days a week—to your company’s sales and marketing goals. Being able to evaluate your business from the inside out is an incredibly important component to long-term growth, and offers valuable perspective. However, there are no rules that say you can’t have both! Most companies find themselves to be most successful when they have one person working in-house on sales and marketing objectives, and help manage an outsourced marketing agency relationship. They are able to serve as a great liaison between your company and your marketing firm, to ensure that all parties are on the same page all the time, and all teams are working to achieve executive goals. If you’re in the process of looking to expand your internal marketing department, take pause. Consider what your options are and make an informed decision about what will be most beneficial in both the short term and the long term!